Paul Showalter: mission worker and pastor of the Edson Mennonite Church, the Prince of Peace Mennonite Fellowship in Grande Prairie, Alberta, and missions (carpentry) worker in several locations. Showalter was born in Garden City, Missouri, on 22 April 1925 and died in a ladder accident near Salem, Oregon, on 30 March 1991. He was married to Nancy Miller. They were the parents of seven children. The Showalter family moved to Edson, Alberta, to serve a struggling congregation there which traced its origins to a few migrants who had arrived in the 1930s. Some of these people had moved away during or after World War II, but a new start was made in 1955 when Eldon and Edna Zook from Idaho moved into the community and provided leadership for the small Mennonite group. In 1957 an abandoned church building in the nearby coal mining community of Cadomin was moved the Edson. Sunday School, Summer Bible School and somewhat irregular worship services were arranged by the Alberta-Saskatchewan Mennonite Conference through visits by bishops and ministers. Then, in 1962, Paul and Nancy Showalter accepted a call to serve as the congregation's first pastoral couple. They led not only in the Sunday School and worship services, but also established an active club program for young people, working in close co-operation with Mennonite voluntary service workers. 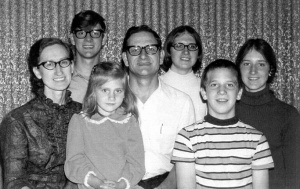 In 1971 the Showalters followed a dream to establish a new congregation in a larger northern center and moved to Grande Prairie, Alberta. There they worked for a time with leaders of the Hillcrest Mennonite Church which was affiliated with the Conference of Mennonites in Alberta - a sister conference of the Alberta-Saskatchewan Mennonite Church with which the Showalters were affiliated. The Showalters moved across town and established a new Mennonite Church - the Peace Mennonite Church - in 1975. That congregation was able, in 1979, to purchase its own church building, but in yet another sector of the city which necessitated another move. Church growth was slow, and an attempt to attract and work with a Mennonite voluntary service couple proved disappointing. In addition, some students from the Peace River Bible Institute who had assisted in the work were unable to continue when that institution closed its doors. Somewhat discouraged, and convinced that the work in Grande Prairie needed new leadership, the Showalters left in 1985 when Paul accepted a voluntary service assignment as a roving carpenter with the Mennonite Board of Missions. It was while working in this capacity at the Western Mennonite School near Salem, Oregon, that Paul Showalter suffered fatal injuries as a result of a fall from a ladder. Paul Showalter was a servant leader, serving both congregations and broader Mennonite church. His practical approach to ministry was widely appreciated. Obituary Notice for Paul Showalter in the Gospel Herald. Regehr, T. D. Faith, Life and Witness in the Northwest: A Centennial History of the Northwest Mennonite Conference. Kitchener, ON: Pandora Press, 2003. Regehr, Ted D. "Showalter, Paul (1925-1991)." Global Anabaptist Mennonite Encyclopedia Online. December 2003. Web. 20 Apr 2019. http://gameo.org/index.php?title=Showalter,_Paul_(1925-1991)&oldid=112140. Regehr, Ted D. (December 2003). Showalter, Paul (1925-1991). Global Anabaptist Mennonite Encyclopedia Online. Retrieved 20 April 2019, from http://gameo.org/index.php?title=Showalter,_Paul_(1925-1991)&oldid=112140. This page was last modified on 23 January 2014, at 21:31.